Civil rights leaders, including Dr. Martin Luther King, Jr., sing "We Shall Overcome" at the conclusion of the Selma to Montgomery civil rights march in 1965. The same law firm that recently succeeded in releasing "Happy Birthday" from copyright rules is now hoping to do the same for "We Shall Overcome." Filed Tuesday in New York federal court, the suit claims the song belongs in the public domain, and seeks a return of "unlawful licensing fees" from the publishers. The lawsuit was filed on behalf of the We Shall Overcome Foundation, a non-profit lead by Isaias Gamboa. A few years ago, Gamboa wrote a book about the history of the song. Now, he's working on a documentary based on his research. When he contacted the song's publishers, "they actually prevented me from using the song in the film, which I wasn't expecting," he says. Knowing the song's origins, Gamboa says he couldn't understand why "We Shall Overcome" would be copyrighted in the first place. "It was always a derivative work," he says, "and was based on a spiritual from back in the day, as they say." The song's roots run deep. Slaves sang "I'll overcome" in the fields; striking workers sang "we will overcome" on the picket lines. It was an African-American spiritual. So how did the version we know today get copyrighted at all? A little more history: In the 1940s, African-American tobacco workers sang a version of the song on the picket lines in South Carolina. They introduced the song at the Highlander Folk Center in Tennessee, a meeting place for black and white labor activists. Highlander's music director, Zilphia Horton, introduced the song to Pete Seeger, who helped turn it into an international protest anthem. In the early 1960s, Ludlow Music registered "We Shall Overcome" as an "unpublished derivative work." The plaintiff claims this copyright only covers some new verses and an arrangement, not the original melody and lyrics. Ludlow's copyright names four people, including Zilphia Horton and Pete Seeger. In a 1993 book, Seeger said he and the others only signed the copyright to protect its legacy. "In the early '60s our publishers said to us, 'If you don't copyright this now, some Hollywood types will have a version out next year — like, 'come on baby, we shall overcome tonight,'" Seeger wrote. The defendants in the case, The Richmond Organization and Ludlow Music, declined to be interviewed. In a statement to NPR, they write the lawsuit "goes too far and attempts to nullify the contribution of these authors which brought into being the iconic song we know today." The publishers also write that "100% of the writers' royalties generated by 'We Shall Overcome' have gone to the 'We Shall Overcome Fund' operating in affiliation with the Highlander Folk School in Monteagle, Tennessee, supporting the Fund's mission to nurture grassroots efforts within African American communities to use art and activism against injustice." The most famous civil rights song is the subject of a new lawsuit. 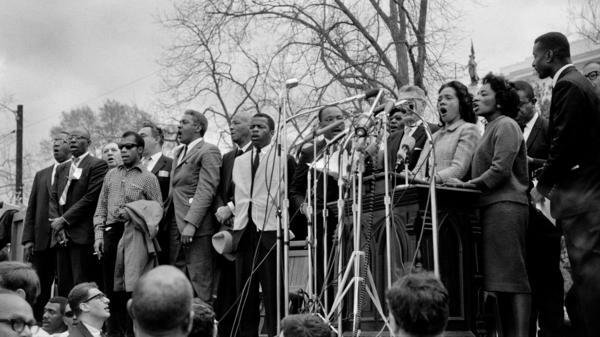 A complaint has been filed in New York federal court over the copyright to "We Shall Overcome." NPR's Elizabeth Blair has the story. ELIZABETH BLAIR, BYLINE: The song's roots go way back. It was a folk song, a protest anthem well before the civil rights movement, and it was a spiritual. THE MIGHTY CLOUDS OF JOY: (Singing) We will overcome. BLAIR: This is a version from the gospel group The Mighty Clouds of Joy. THE MIGHTY CLOUDS OF JOY: (Singing)We will overcome someday. BLAIR: The history of the song is relevant to the lawsuit. It was filed on behalf of the We Shall Overcome Foundation, a nonprofit led by Isaias Gamboa. A few years ago, he wrote a book about the history of the song. Now, he's working on a documentary based on his research, so he contacted the song's publisher, the Richmond Organization and Ludlow Music. ISAIAS GAMBOA: They actually prevented me from using the song in the film, which I wasn't expecting. BLAIR: Gamboa says, knowing the history of the song, he couldn't understand why it would be copyrighted in the first place. GAMBOA: It was always a derivative work, and it was based on a spiritual, you know, from back in the day, as they say. BLAIR: So how did it get copyrighted at all? First, a little more history. In the 1940s, African-American tobacco workers sang a version of the song on the picket lines in South Carolina. They introduced the song at the Highlander Folk Center in Tennessee, a meeting place for black and white labor activists. That's how Pete Seeger picked it up. PETE SEEGER: (Singing) We shall overcome someday. BLAIR: In the early 1960s, Ludlow Music registered "We Shall Overcome" as an unpublished derivative work. That copyright names four people, including Pete Seeger. In his 1993 book, he said he only signed it to keep Hollywood from getting a hold of it. This new lawsuit claims the copyright only covers some new verses and an arrangement, not the original melody and lyrics, and the publisher shouldn't be collecting royalties. The song's publishers declined to record an interview for this story. In a statement to NPR, their lawyer says the lawsuit goes too far. He also said that 100 percent of "We Shall Overcome's" royalties goes to a fund that works with African-American communities to use art and activism against injustice. Elizabeth Blair, NPR News. Transcript provided by NPR, Copyright NPR.